When it was time to replace the Fiat 500, many engine and chassis configurations were designed, built, and tested. The layout for the 600 was chosen for a simple reason –low manufacturing costs. 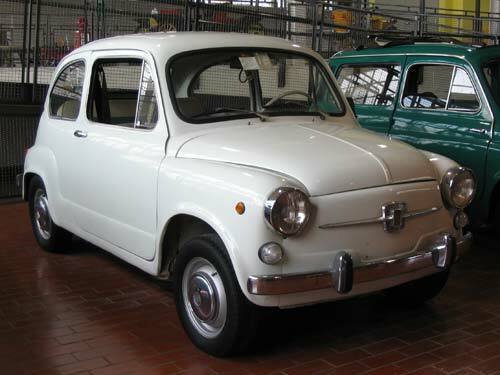 Fiat introduced the 600 at the Geneva Motor Show of 1955. It was part of the postwar Italian “economic miracle” that helped mobilize the country, being produced in large numbers (for its time). As released, the 600 was a two (suicide) door, four seat car with a 633cc, water cooled, four cylinder engine located behind the rear seats and driving the rear wheels. Other notable features were the monocoque construction and the independent suspension on all four wheels. The 600 enjoyed a long lifespan, and Fiat not only used the 600 chassis for other models such as the Multipla (world’s first Minivan? – perhaps), they also sold chassis and drivetrain components to other small manufacturers for their own specialized offerings.